1 A None No Power Seat 1 A is a Business Class that has restricted legroom due to the position of the bulkhead. The close proximity to the galleys may be bothersome. The tray table is in the armrest, making the armrest immovable and slightly reducing seat width. There is no floor storage for this seat during takeoff and landing. 1 C None No Power Seat 1 C is a Business Class that has restricted legroom due to the position of the bulkhead. The close proximity to the galleys may be bothersome. The tray table is in the armrest, making the armrest immovable and slightly reducing seat width. There is no floor storage for this seat during takeoff and landing. 10 A None No Power Seat 10 A is a standard Economy Comfort seat. 10 B None No Power Seat 10 B is an Economy Comfort seat that is blocked off to allow more space for passengers seated in the window and aisle seats. 10 C None No Power Seat 10 C is a standard Economy Comfort seat. 10 D None No Power Seat 10 D is a standard Economy Comfort seat. 10 E None No Power Seat 10 E is an Economy Comfort seat that is blocked off to allow more space for passengers seated in the window and aisle seats. 10 F None No Power Seat 10 F is a standard Economy Comfort seat. 11 B None No Power Seat 11 B is an Economy Comfort seat that is blocked off to allow more space for passengers seated in the window and aisle seats. 11 E None No Power Seat 11 E is an Economy Comfort seat that is blocked off to allow more space for passengers seated in the window and aisle seats. 12 A None No Power Seat 12 A is a standard Economy Comfort seat that is missing a window. 12 B None No Power Seat 12 B is an Economy Comfort seat that is blocked off to allow more space for passengers seated in the window and aisle seats. 12 E None No Power Seat 12 E is an Economy Comfort seat that is blocked off to allow more space for passengers seated in the window and aisle seats. 12 F None No Power Seat 12 F is a standard Economy Comfort seat that is missing a window. 13 A None No Power Seat 13 A is a standard Economy Comfort seat. 13 B None No Power Seat 13 B is an Economy Comfort seat that is blocked off to allow more space for passengers seated in the window and aisle seats. 13 C None No Power Seat 13 C is a standard Economy Comfort seat. 13 D None No Power Seat 13 D is a standard Economy Comfort seat. 13 E None No Power Seat 13 E is an Economy Comfort seat that is blocked off to allow more space for passengers seated in the window and aisle seats. 13 F None No Power Seat 13 F is a standard Economy Comfort seat. 14 B None No Power Seat 14 B is an Economy Comfort seat that is blocked off to allow more space for passengers seated in the window and aisle seats. 14 E None No Power Seat 14 E is an Economy Comfort seat that is blocked off to allow more space for passengers seated in the window and aisle seats. 15 A None No Power Seat 15 A is an Economy Class seat that does not recline due to the exit row behind. 15 B None No Power Seat 15 B is an Economy Class seat that does not recline due to the exit row behind. 15 C None No Power Seat 15 C is an Economy Class seat that does not recline due to the exit row behind. 15 D None No Power Seat 15 D is an Economy Class seat that does not recline due to the exit row behind. 15 E None No Power Seat 15 E is an Economy Class seat that does not recline due to the exit row behind. 15 F None No Power Seat 15 F is an Economy Class seat that does not recline due to the exit row behind. 16 A None No Power Seat 16 A is an Economy Class seat that may have extra legroom due to the exit row in front. However, this seat does not recline due to the exit row in back. Passengers should be aware that in rows 7,9,16 & 17, the video screen is located beneath the seat and there is a button on the side of the seat to pull the screen forwards and up. 16 B None No Power Seat 16 B is an Economy Class seat that may have extra legroom due to the exit row in front. However, this seat does not recline due to the exit row in back. Passengers should be aware that in rows 7,9,16 & 17, the video screen is located beneath the seat and there is a button on the side of the seat to pull the screen forwards and up. 16 C None No Power Seat 16 C is an Economy Class seat that may have extra legroom due to the exit row in front. However, this seat does not recline due to the exit row in back. Passengers should be aware that in rows 7,9,16 & 17, the video screen is located beneath the seat and there is a button on the side of the seat to pull the screen forwards and up. 16 D None No Power Seat 16 D is an Economy Class seat that may have extra legroom due to the exit row in front. However, this seat does not recline due to the exit row in back. Passengers should be aware that in rows 7,9,16 & 17, the video screen is located beneath the seat and there is a button on the side of the seat to pull the screen forwards and up. 16 E None No Power Seat 16 E is an Economy Class seat that may have extra legroom due to the exit row in front. However, this seat does not recline due to the exit row in back. Passengers should be aware that in rows 7,9,16 & 17, the video screen is located beneath the seat and there is a button on the side of the seat to pull the screen forwards and up. 16 F None No Power Seat 16 F is an Economy Class seat that may have extra legroom due to the exit row in front. However, this seat does not recline due to the exit row in back. Passengers should be aware that in rows 7,9,16 & 17, the video screen is located beneath the seat and there is a button on the side of the seat to pull the screen forwards and up. 17 A None No Power Seat 17 A is an Economy Class seat. Passengers should be aware that in rows 7,9,16 & 17, the video screen is located beneath the seat and there is a button on the side of the seat to pull the screen forwards and up. 17 B None No Power Seat 17 B is an Economy Class seat. Passengers should be aware that in rows 7,9,16 & 17, the video screen is located beneath the seat and there is a button on the side of the seat to pull the screen forwards and up. 17 C None No Power Seat 17 C is an Economy Class seat. Passengers should be aware that in rows 7,9,16 & 17, the video screen is located beneath the seat and there is a button on the side of the seat to pull the screen forwards and up. 17 D None No Power Seat 17 D is an Economy Class seat. Passengers should be aware that in rows 7,9,16 & 17, the video screen is located beneath the seat and there is a button on the side of the seat to pull the screen forwards and up. 17 E None No Power Seat 17 E is an Economy Class seat. Passengers should be aware that in rows 7,9,16 & 17, the video screen is located beneath the seat and there is a button on the side of the seat to pull the screen forwards and up. 17 F None No Power Seat 17 F is an Economy Class seat. Passengers should be aware that in rows 7,9,16 & 17, the video screen is located beneath the seat and there is a button on the side of the seat to pull the screen forwards and up. 2 D None No Power Seat 2 D is a Business Class Bulkhead seat that may have extra legroom. The close proximity to the galleys may be bothersome. There is no floor storage for this seat during takeoff and landing. The tray table and video monitor is in the armrest, making the armrest immovable and slightly reducing seat width. 2 F None No Power Seat 2 F is a Business Class Bulkhead seat that may have extra legroom. The close proximity to the galleys may be bothersome. There is no floor storage for this seat during takeoff and landing. The tray table and video monitor is in the armrest, making the armrest immovable and slightly reducing seat width. 33 C None No Power Seat 33 C is an Economy Class seat whose close proximity to the lavatories may be bothersome. 33 D None No Power Seat 33 D is an Economy Class seat whose close proximity to the lavatories may be bothersome. 34 A None No Power Seat 34 A is an Economy Class seat that is in the last row of the plane and may have limited recline. The close proximity to the lavatories behind may be bothersome. 34 B None No Power Seat 34 B is an Economy Class seat that is in the last row of the plane and may have limited recline. The close proximity to the lavatories behind may be bothersome. 34 C None No Power Seat 34 C is an Economy Class seat that is in the last row of the plane and may have limited recline. The close proximity to the lavatories behind may be bothersome. 34 D None No Power Seat 34 D is an Economy Class seat that is in the last row of the plane and may have limited recline. The close proximity to the lavatories behind may be bothersome. 34 E None No Power Seat 34 E is an Economy Class seat that is in the last row of the plane and may have limited recline. The close proximity to the lavatories behind may be bothersome. 34 F None No Power Seat 34 F is an Economy Class seat that is in the last row of the plane and may have limited recline. The close proximity to the lavatories behind may be bothersome. 6 C None No Power Seat 6 C is a Business Class seat whose close proximity to the lavatory behind may be bothersome, as passengers often congregate in this area. 6 D None No Power Seat 6 D is a Business Class seat whose close proximity to the lavatory behind may be bothersome, as passengers often congregate in this area. 7 D None No Power Seat 7 D is an Economy Comfort Bulkhead seat that has extra legroom due to the position of the Bulkhead in front. However the close proximity to the lavatory may be bothersome as many passengers have complained that others congregate in this area when waiting for the lavatory. This row may also be missing a window. Passengers should be aware that in rows 7,9,16 & 17 the video screen is located beneath the seat and there is a button on the side of the seat to pull the screen forwards and up. 7 E None No Power Seat 7 E is an Economy Comfort seat that is blocked off to allow more space for passengers seated in the window and aisle seats. 7 F None No Power Seat 7 F is an Economy Comfort Bulkhead seat that has extra legroom due to the position of the bulkhead in front however, does not recline. The close proximity to the lavatory may be bothersome as many passengers have complained that others congregate in this area when waiting for the lavatory. This row may also be missing a window. Passengers should be aware that in rows 7,9,16 & 17 the video screen is located beneath the seat and there is a button on the side of the seat to pull the screen forwards and up. 8 D None No Power Seat 8 D is an Economy Comfort seat that does not recline. The close proximity to the lavatory may be bothersome as many passengers have complained that others congregate in this area when waiting for the lavatory. This row may also be missing a window. 8 E None No Power Seat 8 E is an Economy Comfort seat that is blocked off to allow more space for passengers seated in the window and aisle seats. 9 A None No Power Seat 9 A is an Economy Comfort Exit row seat whose legroom is obstructed by the protrusion of the exit door. The close proximity to the lavatories may also be bothersome as people often tend to congregate in this area while waiting for the lavatory. Passengers have often reported that it gets cold by the exits during flight. The tray table is in the armrest making the armrest immovable and slightly reducing seat width. Passengers should be aware that in rows 7,9,16 & 17, the video screen is located beneath the seat and there is a button on the side of the seat to pull the screen forwards and up. 9 B None No Power Seat 9 B is an Economy Comfort seat that is blocked off to allow more space for passengers seated in the window and aisle seats. 9 C None No Power Seat 9 C is an Economy Comfort Exit row seat that has extra legroom. However the close proximity to the lavatory may be bothersome as passengers seated in this row are often bumped into by others waiting for the lavatory. Passengers have often reported that it gets cold by the exits during flight. The tray table is in the armrest making the armrest immovable and slightly reducing seat width. Passengers should be aware that in rows 7,9,16 & 17, the video screen is located beneath the seat and there is a button on the side of the seat to pull the screen forwards and up. 9 D None No Power Seat 9 D is an Economy Comfort Exit row seat that has extra legroom. However the close proximity to the lavatory may be bothersome as passengers seated in this row are often bumped into by others waiting for the lavatory. Passengers have often reported that it gets cold by the exits during flight. The tray table is in the armrest making the armrest immovable and slightly reducing seat width. Passengers should be aware that in rows 7,9,16 & 17, the video screen is located beneath the seat and there is a button on the side of the seat to pull the screen forwards and up. 9 E None No Power Seat 9 E is an Economy Comfort seat that is blocked off to allow more space for passengers seated in the window and aisle seats. 9 F None No Power Seat 9 F is an Economy Comfort Exit row seat whose legroom is obstructed by the protrusion of the exit door. The close proximity to the lavatories may also be bothersome as people often tend to congregate in this area while waiting for the lavatory. Passengers have often reported that it gets cold by the exits during flight. The tray table is in the armrest making the armrest immovable and slightly reducing seat width. Passengers should be aware that in rows 7,9,16 & 17, the video screen is located beneath the seat and there is a button on the side of the seat to pull the screen forwards and up. Wi-Fi connectivity is available on board this aircraft. Saga Class is Icelandair's Business Class cabin. Passengers flying Saga Class enjoy good working space and Icelandair lounge access in Iceland and other countries. Full booking flexibility, including changes and cancellations. Saga Class has 22 seats and extends from rows 1-6. Economy Class is the lowest fare class. A choice of a seat selection is offered when booking a ticket. Soft drinks and access to the new in-flight Entertainment System are complimentary. Economy Class has 161 seats. 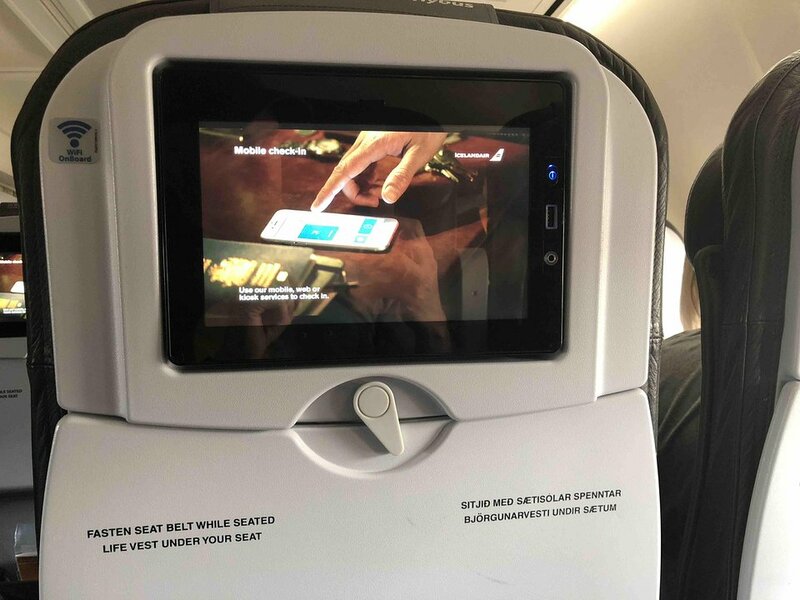 Passengers should be aware that in rows 7,9,16 & 17 of Economy Class, the video screen is located beneath the seat and there is a button on the side of the seat to pull the screen fowards and up. The maximum number of seats sold in Saga Class is 22. However if not all the seats of this fare class are sold, these seats are convetible to fill additional Economy Class tickets. The obstruction of the door isn't a problem at all, one can still completly strech there legs. The great thing about this seat is that IT IS FREE (because of the door beeing slighlty in the way). So great deal, I highly recommend it. I flew from Dulles IAD to Iceland on 22 Aug and paid $65 for Seat 10D supposedly a seat with more leg room. What I had was a seat that would not allow me to extend both of my legs at the same time due to hardware of the seat in front of me. The seats were so close that every time the passenger in front of me the back of his seat would hit my knees. The seats themselves were as hard as wood. The back had no padding at all and would not even recline a little bit. In general it was the most uncomfortable flight I have ever had since I started flying with commercial aircraft in 1948. This seat is above the wing and has little view outside. Also, meals will probably have run out by the time the flight attendants arrive at tour seat. Buy in advance! Plenty of legroom, one USB power port per seat, odd smell from the nearby lavatories but whatever. We had a very enjoyable flight from CDG to KEF. We had a 2 hour delay due to an unruly passenger having to be removed but overall we found the flight very comfortable. The business seats were quite roomy and comfortable. Cabin service was excellent and the food and drink were very nice. We are looking forward to our return flight. The seats in business class resemble a bit of the last Sabena business class seats, a 90/00s config. I find them very comfortable and the service is outstanding as usual. The recline is plenty for 3-5 hour flights. The most uncomfortable business class seats I have ever experienced on any airline I've flown with - and that's many. Pitch and recline are very inadequate, seat comfort is terrible - very poor ergonomics, risk of cutting blood circulation to the legs. Not suitable for sleeping during a night flight. All the seats in this cabin are the same in these respects. Not recommended unless you don't care about comfort or sleeping on a plane. Flew this route from Munich to Reykjavik. 24B is a well cushioned and narrow seat. There was a media storage box under the seat in front of me, blocking my bag -- they're spread throughout the plane. 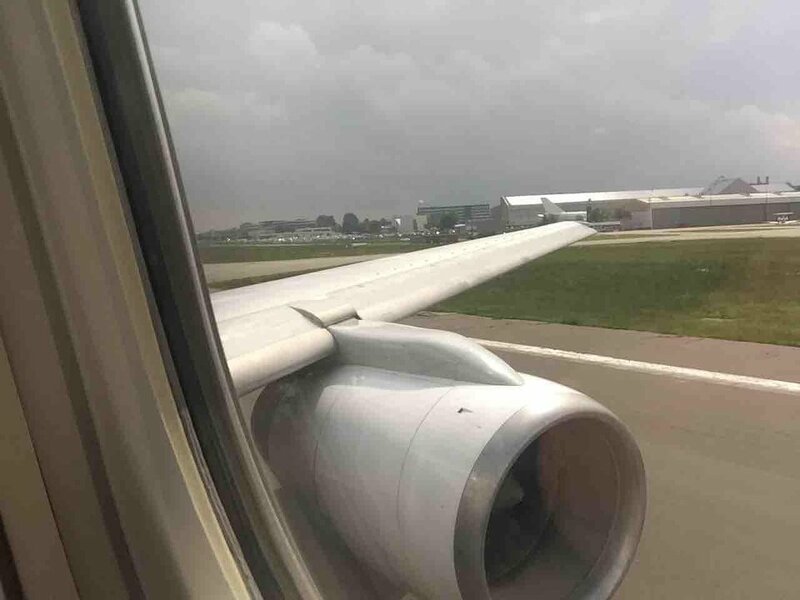 Also, row 24 was the last to be served and the last to deplane -- connection catching was not fun! I think all the economy seats are painful on this plane. No matter the aisle or the window, the narrow seats just hurt. Horrible plane on the whole. Incredibly uncomfortable for an 8 hour flight. No reclining makes it worse when the person in front of you does recline. I was in a car accident a month prior to my flight, and the extra narrow seat made my hips hurt. You can't even shift your weight without bothering the person next to you. Did have usb power on the tv. all and all, very painful flight. Icelandair in addition to sometimes reconfiguring Economy Comfort seats into Economy will sometimes slide the Saga Class bulkhead forward and sell the Saga Class seats in rows 5 and 6 as Economy Comfort. 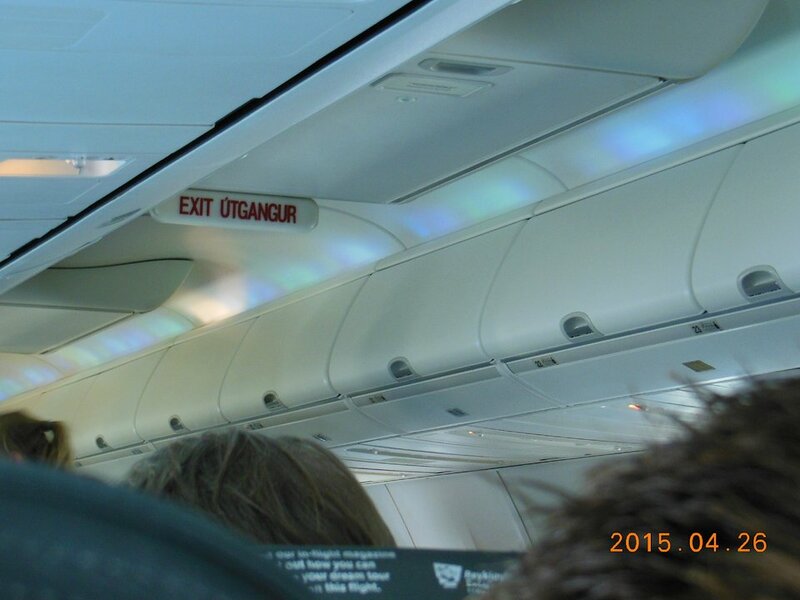 This review is for 10D on the Icelandair 757-200. It is right behind the seats near the exits. That makes this one of the best seats on the plane. Why? I shouldn't even mention this but here we go: Front seat CANNOT lean back, so you will have no obstruction from the passenger in front of you dropping the back of their seat in your lap. Also, because of the design of the sea in front of you, you actually have a bit more leg room than in any of the economy seats (I imagine this is for all seats in the 10th row). However, 10D is the best in this row (and I imagine the outside seat in the opposite row) because you can lift the arm-wrest on your left side. None of the other seats in row D can lift their arm-wrest except the aisle seats. Floor space is limited for this seat with power equipment mounted under 11D. Overall not bad but a tight fit if you are 6'1"
This seat is horrible. And Iceland Air chnaged my assigned aisle seat to a middle iseat in row 15 with no notice. Bad service. Bad attitude. Decided to try Iceland Air. Never again. Flew DEN-KEF, KEF-BOS. I wanted to give some input to rows 6-8 and 11. We flew Economy Comfort which for the DEN-KEF flight for which EC was only rows 4-10. We were able to get into row 6 which is the last of the Saga class seats (no Saga class service). We were originally in row 7, but I had misapprehensions about the reports here about there being no recline and about the Icelandair.com map showing no row 8. We were in an EC row sold as Economy for the KEF-BOS flight. 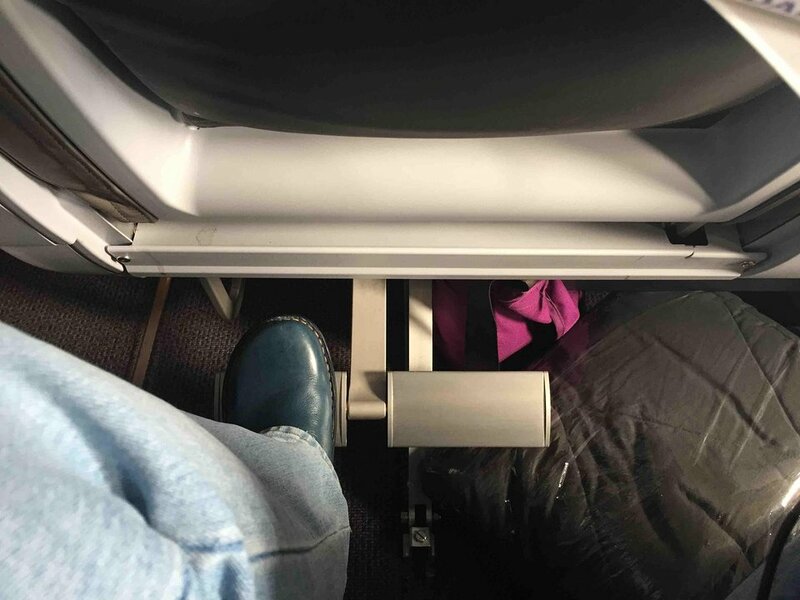 From our flight experiences: --ROW 6: well-padded and wide seat was good but the footrest gets in the way of being able to stretch your legs out properly. I'm 5'10" and the seat was good and definitely along the lines of a std domestic first seat. If you can get a Saga seat, then EC is worth the cost. --ROW 7: I couldn't find any info anywhere about this row so we checked it out to give info here. Fixed seats like in exit row, so no singular armrest. Was EC so the middle seat was blocked out. Aisle and window seats both reclined and there was a window there. Soft bulkhead with loads of legroom. --ROW 8: Doesn't seem to be an EC row. It didn't show on the Icelandair.com map when you're selecting an EC seat most likely because they are definitely straight Economy seats - they looked really cramped. Again, these seats are also fixed seats like an exit row seat. --ROW 11: Listed as an EC row but it was sold as standard Economy. I sat in 11B. 11A had a window. EC rows' armrests don't fold up at all they only move in about an inch toward the middle seat to enable a wider EC seat. Pretty standard economy seat otherwise. I was apprehensive when i saw 11A marked "bad" but i found no justification in the comments. I had no trouble with 11A as a Comfort Economy seat. I moved the arm rest over to make a few extra inches of width (there's a switch under the arm rest) and enjoyed having extra tray space in seat 11B. Foot rests are nice for variety and short legs on 7 hour flights. All four of us travelled on this plane on 7th Oct 2016 and returned 15 Oct 2016 the experience was awful, air quality was terrible and the closeness of the seats was very uncomfortable. We wanted to up grade to premium economy on our return flight but the cost was the full price of a ticket plus what we had already paid. What the heck ! ! ! The narrow body jet is not pleasant. Sorry Icelandic air if you want tourists visiting your area provide wide body jets for flights over 6hrs !! ! Flying antiquated 757 with almost no recline as 'business class' is a nice 20th century carrier. I will not fly to the USA with Icelandair again. We reserved a seat in the rear-most row (Row 34)to be close to the main toilets due to a medical condition. Point 1, none of the rear row recline - unacceptable for long-haul. Point 2, the 3-3 seat configuration is cramped. The single aisle is narrow and restrictive. Point 3, the ac was changed such that Row 34 disappeared!! The rear-most row became 33, so we were allocated random seats elsewhere without consideration of the medical condition. Despite numerous protests and email exchanges Icelandair would do nothing to assist and did not even recognise that we had stated a medical condition on our booking. Shame on Icelandair. I flew on 8/29/16. The seat map shows this seat as Economy Comfort, but I booked it as standard Economy class. The level of comfort I experienced was even worse than what one would expect in Economy, i.e., it was very UNcomfortable. I am an average height woman (5' 6"). I am usually fine, if a little cramped, in Economy, but on this flight my seat provided zero knee room even when the seat in front of me was not reclining. There was also very little space under the seat in front for my personal item and, therefore, my feet. It was an aisle seat, and I know that the space under the aisle seats is often narrower than that under the other seats, but the width of the underseat area was even smaller than usual, probably because of IFE equipment. Between these two space restrictions--knees jammed against the back of Seat 13D and no room for my feet, I spent most of the flight fidgeting in my seat to get comfortable and walking around in the very narrow aisle. Second issue: there is no excuse for the chaotic boarding situation noted by others. Three large US-bound flights were boarding simultaneously with all passengers crammed into a space about the size of a small waiting area for one gate in most US airports. No seating, no communications, no system for boarding, no jetway. Worst boarding experience ever. I flew from Newark to Glasgow via Reykjavik round trip in Economy Comfort and on all 4 flights sat in either row 5 or 6. The seats were the same as in Saga Class with the same amenities minus a hot meal and warm towel. I was told they had reconfigured some of the planes. I had this seat twice in a riw, from PDX to Reykjavik, and then from Reykjavik to Birmingham UK. On both flights it had the same problem: there is a large upright metal box (holding equipment of some kind, I presume) behind the row 5 seats on this side. Result is that they won't recline. The seats themselves are and after a couple of hours, no about of shifting around will relieve your sore bottom. The seats in these planes are very VERY uncomfortable, esp. for a long 7 hr night flight. There is hardly ANY recline. ALL business class seats recline no more than a few(2-4) inches. There is limited leg room.& there is NO way you can sleep in these seats, there is NO privacy between seats. U R given a blanket & pillow as well. I will NOT recommend Business Class for flights over 3 hrs on Iceland air UNLESS they retrofit with new business class seats.There is NO difference between these & 1st class seats on Domestic USA flights which are equally very painful. The Inflight entertainment system is just about average, small screens & not a lot of choice. The Food however is very good, good choices & very generous portion sizes, tastes fresh . The saga lounge in Keflavick is very good, wide selection of free drinks/water/hot & cold snacks/meal, & soup/deserts/salad/fruits. The Boarding process from KEF is very chaotic with every one Boarding at once, however from Orlando was very organized. The Crew is nice & helpful. Flew DEN-KEF-CDG roundtrip in Saga class. Seats 1AC do not have a cutout in the bulkhead, and have limited legroom as a result. We changed to 3DF and had much more legroom. 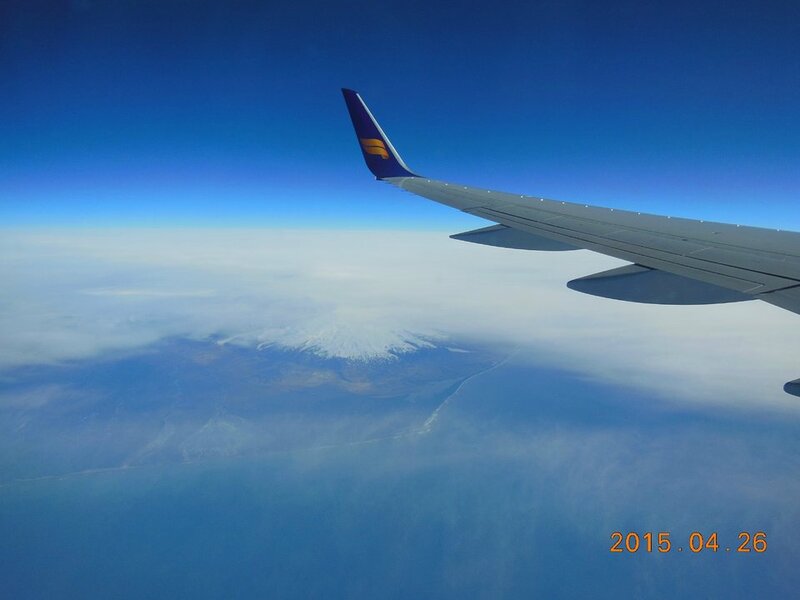 Overall, Icelandair is a great value and has provided us with two good experiences over the last two years. I had to use the rope-lasso object to take the screen out of my armrest - it was stiff and hard to move. Afterwards, I had to have my screen at a weird angle as it kept swinging to a side. 9F is still booked as an Economy Class seat - I had only paid for Economy and I was assigned this seat when I printed my boarding pass at Keflavík. Passengers start to build up to wait for the lavatory. There is one window perfectly aligned to see out of from this seat. Flight FRA-KEF-FRA. Old bird, but very clean, updated interior and very good AVOD. Seat pitch is better than most European carriers in Eco. Very helpful and nice flight attendants. You get soft drinks and tea/coffee for free, anything else is for money. Overall a good experience. On the aircraft we were on for the flight of 2 December 2015, the armrest between the seats was fixed and could not be raised or moved in any manner. Even though Seat 10D was vacant, it did us no good since we could not spread out a little and get some sleep. This stinks. Also, the monitors for the IFE system are very, very bright. There ought to be an automatic way that when the lights on the aircraft are dimmed for enroute operation, that the maximum brightness on these screens is reduced. The people in the row in front of us turned on their monitors, then put on sleep masks and went to sleep, which left us blinded for the entire flight. Terribly rude. This is an excellent seat for the three hours LHR>KEF, or indeed for longer flights. Plenty of room; soft and comfortable.Quiet too. Not sure about trying to sleep on a night flight as they are just recliners. Excellent (new)IFE. Wifi:free for SAGA class; economy get charged but it is reasonable. 5-7Mb speed was excellent, with no drop-outs either. I got a lot of work done. Food ok-ish but edible; wine good. FA's attentive. This seat is in the economy comfort section but was sold as an economy seat, if the center seat is empty you can give yourself more room by moving the arm rest accross a couple of inches,there is a small lever under the armrest to do this.This explains why a previous comment notes how narrow the center seat is if the armrests had not been reset from the previous flight. The seats are comfortable enough with ample room even with the tray table down. Two windows give excelent views out, the IFE is easy to use with a good selection of movies, food is available to purchase,pre-order on line to get a discout,food was delivered before the main cabin service started. Easy transfers in Iceland as the airport is only small however not all gates have jetway boarding. I fly the Atlantic often and would definatly use Icelandair again. If travelling in Saga class, be aware that On many of its planes, Icelandair has now removed the cut-outs that used to provide legroom and storage for the bulkhead seats. Therefore those are now definitely BAD SEATS and should be identified as such on the seatmaps. It was the most uncomfortable flight I ever had. The airline companies and manufacturers have devised an extended way to punish the airline traveling public. This was a Boeing 757 with new seats. They have removed almost all of the padding in the seat bottom and back to create a new level of discomfort. To enhance the discomfort, they have reduced the leg room so that they can add an extra row of seats and take in more of our money. I sat in seat 17F from JFK-KEF on the aircraft named "Eldborg" on 6/10/15. Seat was extremely comfortable, with ample legroom, I am 6 ft. tall. The IFE was in the seat in front of me. Great to have the USB located next to the IFE. The seat has good recline. Great seat. Would recommend it and would book it again. Try to avoid seats 2D & 2F. The bulkhead is directly in front with limited leg room. The same is probably true for seat 1A & 1C. Economy Comfort probably has as good if not better leg room as these seats for less money. Sometimes 10E is a standard seat when not used for economy comfort class. But both seats have restricted leg room as the seats in front have tables / video screens etc installed under their seats. While I liked row 7 (despite been opposite a lavatory), be mindful that the video screen results in the arm-rests of this seat been immovable, and the seat width signficantly narrower then the other rows in economy comfort. Both 12A and 12F are 'half window' seats, and less if seat is reclined. Empty space in wall is a noisy air duct, so bring earplugs! We would recommend if you can find any other way to Europe to do it. We were attracted by the direct flight to Iceland from our home city and the transfer in a small airport in Iceland. Unfortunately for the transfer you have to walk down the ramp no matter the temperature and wait in a long line-up to go through security which is a very prolonged process before being allowed to reboard after waiting in a long metal building in a very long cue to get onto your next plane. The regular seats are very small and close to the seat in front of you. If you are over 5ft and 150 pds you will have a very uncomfortable flight particularly if the person in front of you reclines their seat. The heavier people are unable to use their tables as there is no room to open it. We had booked the middle seat but it is indeed narrower and the arm rest does not raise between the seats. Additionally there is very limited room under the seats due a large metal box under the seat in front of you. These planes should only be on shuttles of 1-2 hours not intercontinental flights. The food available is of small portion and not the best quality. (Their credit card machines works quickly however.) To put this in perspective we travel a lot for pleasure and this was the worst experience for comfort that we have ever had on any long distance flight over 2-3 hours. There also is no room to get up and stretch with narrow aisles to a very close space by the bathrooms. We are expecting large numbers of DVT and pulmonary embolus for passengers on this airline. Our aisle seatmate was an 85 year old lady also going to Amsterdam and it was an ordeal for her. My aircraft was Krafla, IAD-KEF and back. 31F and the three seats in that row, did not have working USB ports to charge my phone. There was a spare seat in front of me that did work. I was in 31F for both legs. LHR>KEF. The seat is narrow but ok for 3hrs providing fellow passengers wearing deodorant. The small LCD screen had reasonable range of films for a short flight but poor quality (return trip was newer plane and very good quality)Bring your own earphones (standard 3.5mm plug that you find on all smart phones/iPods). Aircraft was old and it showed. Cabin crew ok but only one visit from the trolley which took ages anyway. this seat should the rated a bad seat. being next to the lavatory there is a constant parade of people using it after food and drinks are served. the odor is nauseating when the door is opened and the noise of the door opening and closing is very disturbing. Icelandair's website and counters at the airport may show row 10 as an emergency exit row seat. It isn't. It is row 9. Trust SeatGuru. We booked Economy class for Keflavik to Boston, but were sat in economy comfort. My seat (11F) was fine, but the middle seat is about 2" narrower than normal, as it is typically not used with economy comfort only using window/aisle. Be aware when booking this middle seat, as it's an extremely tight fit. Icelandair flies 2 versions of Boeing 757-200.